UPDATED: Mon., March 6, 2017, 9:39 p.m.
Voting in favor: Reps. Paul Amador, R-Coeur d’Alene; Vito Barbieri, R-Dalton Gardens; Don Cheatham, R-Post Falls; Sage Dixon, R-Ponderay; Paulette Jordan, D-Plummer; Luke Malek, R-Coeur d’Alene; Ron Mendive, R-Coeur d’Alene; Eric Redman, R-Athol; and Caroline Nilsson Troy, R-Genesee. Voting against: Reps. Priscilla Giddings, R-White Bird; Heather Scott, R-Blanchard; and Paul Shepherd, R-Riggins. BOISE – The Idaho House ground to a halt Monday as a handful of lawmakers fearful about international implications of a bill updating Idaho’s notary laws. The move forced an hour-plus reading of the 21-page bill before lawmakers approved it with just seven “no votes. After freshman Rep. Priscilla Giddings, R-White Bird, objected to waiving the requirement to read the bill – a standard step before debate – her colleagues voted to make her read the bill herself, which she did, standing at the podium at the front of the House where the clerk normally stands. Giddings said afterward that her concern was not just with the bill, but with the way the House routinely waives the constitutional requirement for full readings. 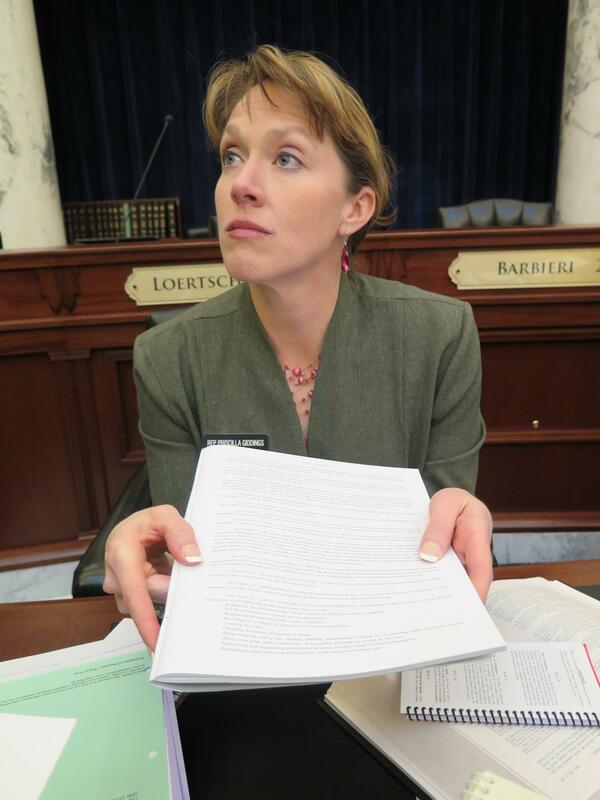 “I ran on a platform to uphold the Idaho Constitution, and that is all that I did today – nothing more, nothing less,” she said. The Uniform Law Commission, established in 1892, is a group of more than 300 attorneys, law professors and judges from across the political spectrum who draft model laws that ease interstate and international transactions. Senate Majority Leader Bart Davis, R-Idaho Falls, has been a member since about 2001. States decide on their own whether to adopt the model laws; the notary bill is a uniform law that was modified for Idaho. Rep. Jason Monks, R-Meridian, spoke in favor of the bill, saying he looked into how it actually was drafted, and it was worked over “line by line” by many groups in Idaho, including the Idaho Bankers Association and the Idaho Secretary of State’s office. While recognizing the use of electronic signatures and electronic document transfer, the bill doesn’t allow remote notarizing; a notary still would have to see a person sign a document in order to certify that it was that person who signed it. After Giddings made her objection, Moyle and other members of House GOP leadership conferred with her, and when she refused to drop her objection, Moyle asked for a call of the House. That means all members must be present, and no one can enter or leave the chamber – not even to use the bathroom. Other House members were surprised by the incident. “It was thoroughly gone over in committee, and the same questions came up,” said Rep. Tom Loertscher, R-Iona, who chairs the House State Affairs Committee. That’s where Giddings, Scott and Zito first object to the bill and tried unsuccessfully to kill it. Giddings said she believes that the wording the Senate uses when it waives full reading is more constitutionally correct than that used in the House, because senators ask that the Senate journal reflect that the bill has been read in full, section by section. She said she’d like the House to follow suit. But she made no mention of that issue when she objected and forced the full reading on Monday, which the House then made her do herself. The call of the House remained in effect throughout the nearly two-hour bill reading and debate. It was the first time a call of the House has been imposed in more than a decade, though the Idaho Senate frequently makes such calls. Published: March 6, 2017, 6:18 p.m. Updated: March 6, 2017, 9:39 p.m.